Set a year after the events of the series, we rejoin our characters in their Future Gadget Laboratory. The timeline shenanigans from the series have calmed down, the microwave time machine is *ahem* ancient history, and all of Rintarō Okabe’s friends are safe. But his actions still have repercussions, and before long, there’s another timeline crises looming. Let’s be clear: there was no need for this movie. The series wrapped things up perfectly, especially with the one-off final episode (that felt like the equivalent on an English TV show’s Christmas special.) That being said, Load Region of Déjà vu is nothing like the catastrophe that was The Last Dark, the feature film that was a massive letdown after the stellar Blood-C series. Here, the story comes back for a third helping, and the time spent in the world is worthwhile. That being said, it doesn’t soar to the same heights that the show did. This is a subtle tale that squeezes the last little bit of narrative out of the concept, and it doesn’t really deserve the 90-minute runtime. If you’re a Steins;Gate fanatic, however, then you’ll still enjoy the film. Right from the opening scene, the dialogue crackles and the characters are as funny as ever. 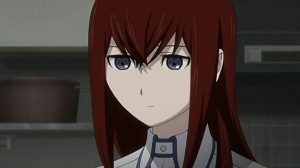 The film provides a little more depth for both Mayuri Shiina and Kurisu Makise, and – without spoiling anything – having Okabe take a narrative back seat is a great idea, letting other characters take the spotlight. The pacing can be sluggish, however, and there are many moments of introspection. We don’t reach Attack on Titan levels of inner monologue, but there’s still too much. The animation looks as good at the TV show, and the lines and colours are beautifully crisp on Blu-ray. There’s never been anything flashy about Steins;Gate, and the same blown-out bright white visual style remains here. The disc features a commentary from the US voice dub team too. The worst you can say about Load Region of Déjà vu is that they could have squeezed the story into another episode of the TV show. It is an enjoyable little coda, however, and if you liked the show you’re bound to enjoy this. Steins;Gate the Movie: Load Region of Déjà vu is available now on DVD and Blu-ray from Madman. This entry was posted in Film Reviews and tagged Anime, Drama, Science Fiction by Stuart Wilson. Bookmark the permalink.